Sometimes historical data in a source system is re-stated or corrected. This means your Metrics and Reports sourced from this data will need to be re-run to reflect these changes. One simple way to do this in Metric Insights is to manually re-run a data collection trigger using the Refetch historical data feature. Delete Data Collected Since: Enter the date of how far back the process should start. For Hourly and Minute data collection intervals, also enter time. All data from the specified date/time will be removed and replaced by newly collected data. Once you click OK to confirm, the system displays a message while deleting the data that will be re-stated. 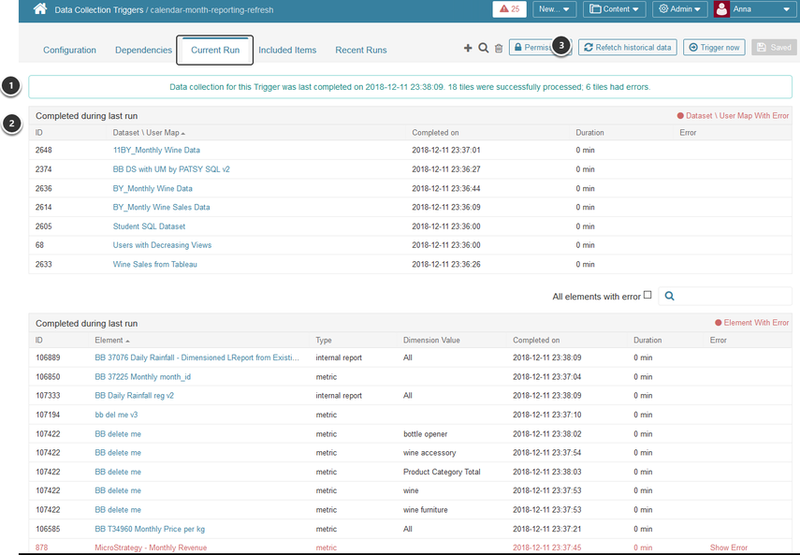 Statuses of all Triggers can be quickly reviewed at the Data Collection Triggers table, with each Trigger being highlighted with a corresponding color.